New York City New York Police Officer Peter Liang has the face of a killer. Killer cops look like normal everyday people, even worse people accept them as good due to a uniform and badge. Fact is America hires the worse people, gives them guns, badges and a costume. Which they hide behind and commit crimes, abuse and murder. While not all police are bad, the good ones often fail to do the right thing when they encounter bad cops. Ego, small man syndrome, insecurity, control freaks, mental issues, social and psycho paths are just a few of the candidates hired today as police officers. Women as well, racist officers are another problem which infect our law enforcement officers. The solution is removing such officers easily and accepting public complaints concerning the officers must be taken seriously. We should not allow second chances for any officer that takes a life. Investigations against crimes by dishonest or abusive cops must be done by non-cops and outside agencies which are not biased. We must remove all incentives and rewards such as paid leave, benefits and legal representation of any officer who breaks the law. Immunity must be banished if an officer commits a crime, injures of kills. 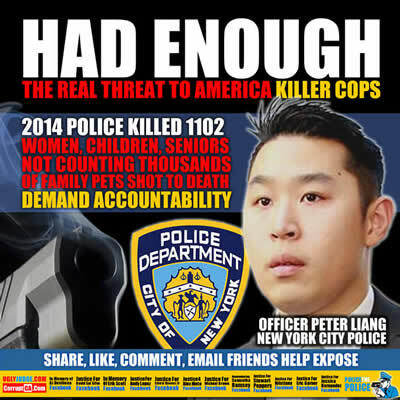 Officer Peter Liang is a killer no doubt about it. He knew the moment he removed his weapon from it’s holster dead could occur, however his fear and cowardliness was more important than human life. After shooting Akai Gurley Officer Peter Liang did nothing for 6 months, did not call 911 or help while this victim was bleeding to death. However records show these killers instead texted their union reps to save their reputations and jobs instead. Guilty? Officer Peter Liang was patrolling with his partner in the Brooklyn housing project at about 11:15 p.m. on Nov. 20 when his gun discharged a single bullet, killing Akai Gurley, 28, who was in the stairwell a flight below with his girlfriend. Whether Liang’s gun went off by mistake or was fired deliberately is likely the most disputed aspect of the shooting. Liang’s court appearance comes two months after another grand jury in the borough of Staten Island voted against indicting one of the police officers who killed Eric Garner, an unarmed black man who was put in a chokehold while being arrested for peddling loose cigarettes. The lack of an indictment sparked a new round of large rallies in the city by protesters who say police are too quick to use violence against black citizens. Mayor Bill de Blasio, who has angered much of his police department by his expressions of support for some of the protests, has said Gurley’s death was an “unspeakable” tragedy.